We’re thrilled to announce that we’ve achieved our fundraising goal for the 2016-2017 Chabot Elementary PTA fall Annual Fund campaign. An impressive 61% of Chabot families joined in raising more than $180,000! These funds will directly support the programs sponsored by the PTA and help us reach the required annual budget of $440,000. Thank you to the entire Chabot community for making this year’s campaign another huge success! Congratulations to the individual class prize winners! Annual Fund Campaign: This was a tight race and we saw a huge surge toward the last few days of the campaign. 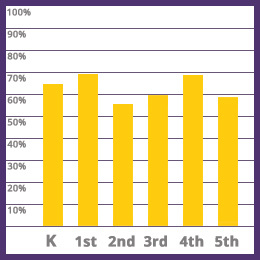 Congratulations to Ms. Diamond’s 3rd grade class for pushing to the end to reach the highest class participation at 79%! The class will receive an ice cream party sponsored by CREAM. PTA Membership Drive: Congratulations to Mr. Nagatani’s kindergarten class for reaching 100% participation. The class earned a pizza party sponsored by Jules Thin Crust Pizza. The drive to reach 100% participation continues! You can still make a contribution or reach out to extended family members in this season of giving. Any gift in any amount helps. Whether it is $5 or $750, it all helps Chabot provide a rare combination of academic excellence and high quality enrichment. If you have any questions about your Annual Fund contribution, please email us at annualfund@chabotelementary.org All Annual Fund participants will receive a letter in January with your donation information that can be used for tax purposes. Anthony Chabot Elementary PTA is a non-profit 501(c)(3), Federal Tax ID# 94-6171779. Your donations are tax deductible.